I am always looking for things to do with mince. As we all know, mince of any kind is a cheap and fairly nutritious way to feed a family. For some reason I don’t have a high tolerance for Asian mince recipes…I couldn’t even tell you why. Maybe the flavours and effort is wasted on mince, I always think of tender strips of good meat when I stir fry. But I came across this recipe that uses pork mince the other day, and it was so simple and packed with flavour that it’s worth sharing. In my kitchen it’s all about achieving the best results with minimum effort. Some call it laziness, I call it ‘effort conscious’. Perfect for those nights when you want a decent meal but can’t be bothered cooking, this recipe is super quick, super easy and uses some basic sauces and flavours of Asian cuisine. If you don’t have any Kecap Manis on hand, just increase the dark soy sauce and add a couple of extra teaspoons of sugar. In some peanut oil, fry garlic and mince in a wok. Add beans, onion and chilli paste. Then throw in a few splashes of fish sauce, sugar and good tablespoon each of dark soy and kecap manis. Season to your taste by using the soy and sugar, if it isn’t already to your liking. Take of the heat and stir through the basil. 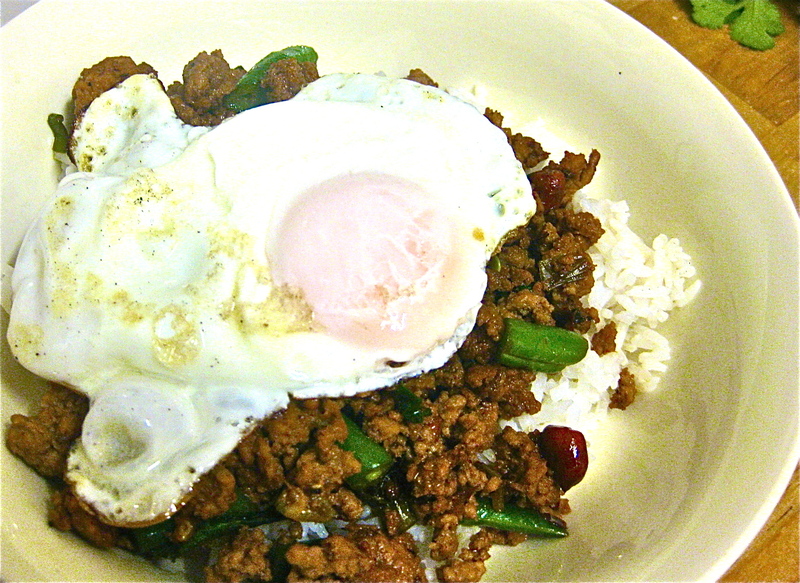 Serve on steamed rice and top with a fried egg or two. This is what I use. I always keep a jar of it in my fridge. You can skim the oil off the top for chilli oil, or use the actual paste if you don’t have chillies handy. I like the one with roasted peanuts inside, but you can also get it with soy beans in it aswell.This stuff is amazing, you get the lovely chilli flavour without a lot of heat.